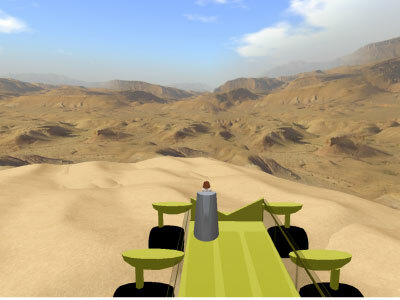 Caledonia Heron is participating in a Desert RATS 3-D mission in Second Life. (NASA Virtual News) – We’re in the Second Life rover yard this morning, preparing for a D-RATS mixed reality event from the Arizona Black Rock volcanic field. We’ll stream the live, real-world webcast into Second Life’s social media 3-D world to create an immersive, participatory experience for the Second Life community. The rover yard in Second Life replicates NASA rover activities so users can share in NASA’s compelling story of science and exploration. Mission concepts and technology models are available to everyone in this hands-on, distance-learning environment. Second Life residents are telepresent as they work together and communicate about the design, analysis and performance of space technology and events. This feeling of telepresence creates a collaborative bond that fosters engagement, conversation, feedback and learning. The rover yard for Desert RATS in Second Life. 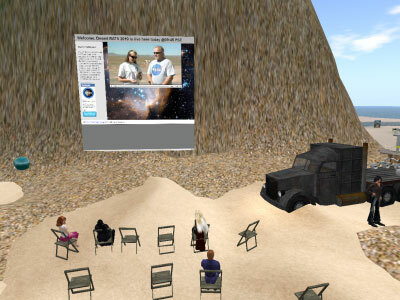 The NASA eEd island is a venue to investigate education outreach and ultimately the usefulness of conducting science in virtual world platforms. As virtual worlds evolve it’s possible that shared virtual spaces such as Second Life will include the planning, development and training for future D-RATS missions. Scientists and engineers will routinely use desktop 3-D technology to spatially investigate large data sets, explore human factors issues and perform simulated tasks. Back from the future of virtual worlds to here and now, where Second Life residents are dropping in to participate in the Arizona D-RATS webcast with NASA scientists. During and after the webcast, the conversation spins from what the rovers will be used for, their destinations, the size of the rovers and vehicles to get them to their destinations. The group is a mix of scientists and educators interested in NASA’s work. The NASA eEd Island in Second Life. You can join the citizen scientist and educator network in Second Life and be a part of virtual NASA at work. Contact the LT Technical Office to have your NASA education project represented. The NASA eEducation island is located in Second Life and sponsored by NASA Learning Technologies, an education technology incubator.